It is not a mistake. 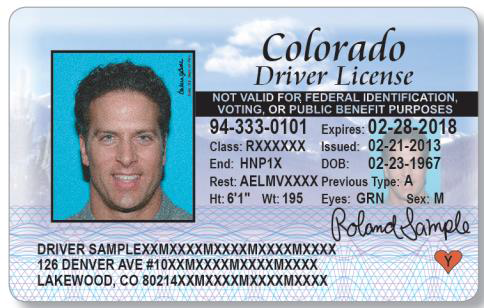 U.S. citizens and lawful permanent residents residing in Colorado continue to receive unrestricted Colorado Driver’s licenses. However, as of August 2014, all foreign nationals residing in Colorado, including individuals on H-1B, L-1, F-1 status and those with DACA, receive a restricted driver’s license with the black bar. Unless you are a U.S. citizen or lawful permanent resident, you will receive your driver’s license with the black bar. The addition of the restriction and accompanying “black bar” is the result of Colorado Road and Community Safety Act (commonly known as Senate Bill 251), which as of August 1, 2014 permits undocumented foreign nationals residing in Colorado to apply for a Colorado Driver’s License. Senate Bill 251 not only permits undocumented Colorado residents to apply for and receive a “restricted” Colorado driver’s license, it also mandates that all foreign nationals regardless of their immigration status receive the restricted driver’s license. The purpose for issuing restricted driver’s licenses to both foreign nationals with immigration documentation and undocumented persons is to ensure that law enforcement does not selectively enforce criminal proceedings against persons not lawfully present in United States. The restriction limits the Colorado driver’s license to state identification and driving purposes and is valid for identification purposes such as opening a bank account and auto registration. Many employers will see foreign national employees with the new restricted license. Importantly, because the restricted license is not valid for federal identification purposes, it cannot be used as an identification document to complete federal form I-9. Thus, employers may not accept the restricted Colorado driver’s license when completing federal Form I-9. Please contact Kolko & Associates, P.C. with questions regarding the Colorado driver’s license and Federal I-9 compliance.